Japanese food is great, but that doesn't mean that the craving for a good slice of pizza won't hit while you're exploring the Land of the Rising Sun! In other parts of the country it can be a tough itch to scratch, but Tokyo is overflowing with options, so we've narrowed it down to ten that are sure to hit the spot. When only tried-and-true Italian-style pizza will do, Napoli Sta’ Ca” is the best place to go. Run by two born-and-bred Italians, they bring the true flavors of Napoli to neon streets of Tokyo. Their first restaurant opened in Azabudai, but they now also have a branch in Komazawa. The owners want to create a friendly and relaxed atmosphere, because after all they are “a pizzeria, not a ristorante." Pros: Friendly, authentic Italian pizza. Cons: Not a very central location. This Nakameguro restaurant may not be run by Italian expats, but it definitely tastes like the real thing! That's because chef Yamamoto Hisanori worked in Napoli perfecting the art of pizza, and actually won awards in Italy two years running! He has brought that perfection with him to this friendly restaurant, which has a great selection of quality pizza at a reasonable price. Pros: Family friendly atmosphere, award-winning chef. Cons: Not suitable for fine dining. Margherita pizza at Savoy in Tokyo. #regram from @noleftovers Tag your pics with both #lefooding and @lefooding and we'll regram our favorites! Full disclosure—this might be one of the best pizzas I've ever had in Japan. 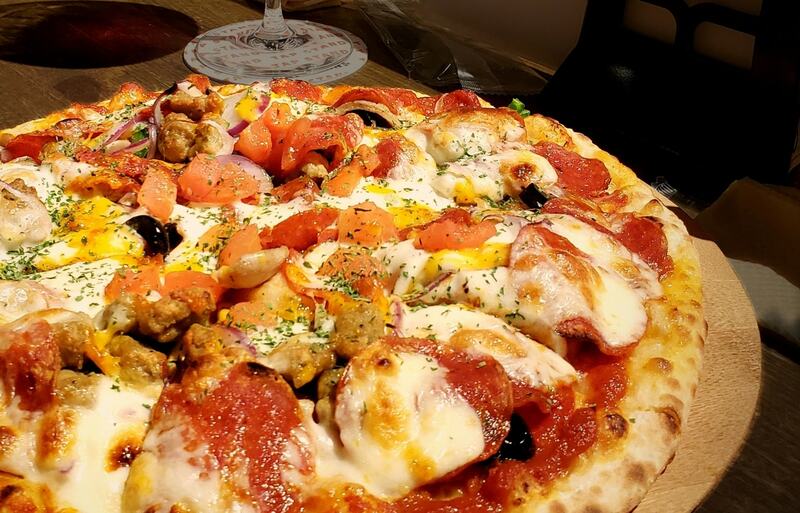 The cozy pizzeria in Azabujuban seats under 10 people, which makes you feel like pizza elite. They only have two types of pizza, but boy do they do them well! They have their own wood-fire oven in which they create beautifully crisp pizza topped with high-quality ingredients. There are also a number of Italian-inspired sides and drinks. The atmosphere may be uniquely Japanese (given that you sit at a bar in full view of the chef) but the taste is certainly Italian. They have a few branches in Tokyo, and there are actually branches throughout the rest of the country as well! Pros: Wood-fired, crispy pizza. Multiple branches. Cons: Minimal seating. Only two types of pizza. This seriously chic venue only seats eight people, and is located within the Mandarin Oriental Hotel. The kitchen is another open concept that allows full view of the chef’s work. Because it has a more refined atmosphere, it's the perfect place for an anniversary with a pizza lover! As you might expect from its location, it isn’t exactly cheap (the cheapest pizza is ¥2,400), but for quality pizza in a great location, it’s definitely worth it. Another benefit is that while seating is limited, they do accept reservations, so you can plan ahead. Pros: Great view. Chic, refined decor. Allows reservations. Cons: Pricier. Minimal seating. Reservations basically required. To non-Americans, a single slice of pizza might not sound particularly filling, but rest-assured you will be satisfied with this grab and go pizza place. A single slice is bigger than your head! There is always a selection of huge pizzas behind the counter, constantly refreshed straight from the oven by the staff. This New York-style pizza place is in a great location, has great pizza and the people running the joint seem pretty cool too! A must if you are in the Shibuya/Roppongi area and have a craving for a killer slice. Pros: Cheap prices. Good location. Huge slices. Cons: Can be quite busy during peak hours. Best known for their Chicago-inspired deep dish pizzas, this is a great place to go to get your fill. Basically impossible to come by anywhere else, this is definitely closest we’ve come to finding authentic Chicago-style deep dish in Japan. The sizes may look small, but don't be fooled! It's deep dish, and surprisingly filling! As a bonus, they also have a great selection of craft beers and ciders, and a few different locations in Tokyo. If you make a reservation you can place your order ahead of time, which is great since cook times for deep dish can be quite long. Pros: Chicago-style deep dish! Alcohol selection. Multiple locations. Cons: Expensive. Takes awhile if you don't order ahead. This place is a great pizza place all around. It's mainly known for its vast array of imported American ales, but Tap Stand also offers some delicious pizzas with a choice of thin or thick crust. What goes better with pizza than a nice refreshing beer? If you’re in Shinjuku and looking for a place to eat, it's just outside the southeast exit! Pros: Convenient location. Great alcohol selection. Nice variety. Cons: Cover charge. Doesn't specialize exclusively in pizza. We couldn’t decide whether to put this under the American or Japanese category, as it’s quite a spectacular blend of both, but seeing as izakaya is right there in the name, we decided to put it here. There are a lot of American-style pizzas that you can’t usually find in Japan, such as BBQ Chicken and Taco, as well as their own house specials. They also have some that you may not have seen elsewhere, such as ahi tuna and avocado, and curry pizza! This is a great place to go if you just want somewhere to sit and spend some time getting a bit tipsy with a good portion of comfort food at your side. Pros: Cool atmosphere. Awesome fusion pizzas. Cons: Very popular, so service can be backed up. Thinking of having an afternoon out at Inokashira Park? Why not round off the evening at this edgy pizzeria. Not for the Italian pizza purists, this place is better suited to the more adventurous pizza lovers. They’ve taken a mix of Italian bases and American flavors to produce something entirely different, including their Americano pizza, which is topped with fries and sausage! Pros: Good location. Many options. Cons: Not for pizza purists. Again, this one is quite a mix, but how can we say no to celebrity chef Salvatore Cuomo, who is an Italian-born Japanese chef himself? Salvatore Cuomo has a number of branches throughout Tokyo, including this snazzy one with a beautiful view, but really what we’re most grateful for is that they do delivery! If you’re bored of typical chains of take-out pizza, then look no further, Salvatore is your savior! Pros: Delicious. Multiple locations. Take-out! Cons: Expensive (compared to many take-out options).